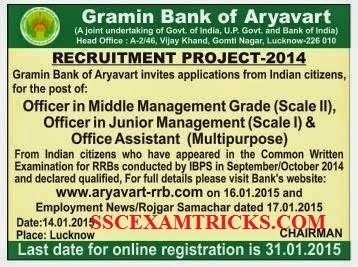 Gramin Bank of Aryavart (GBA) had released latest notification advertisement declared for recruitment of Officer in Middle Management (Grade III), Officer in Junior Management (Grade I), Office Assistants (Multipurpose) based up on the performance in IBPS CWE III held in month of September / October 2014. The recruitment official advertisement will be released on the official website of Bank. The official address website address is mentioned in the middle of the posts. Candidates can read newspaper advertisement publish to update and prepare for the upcoming jobs. ONLINE applications are invited for the vacant posts in GBA on the official website from 16th January 2015 to 31st January 2015.